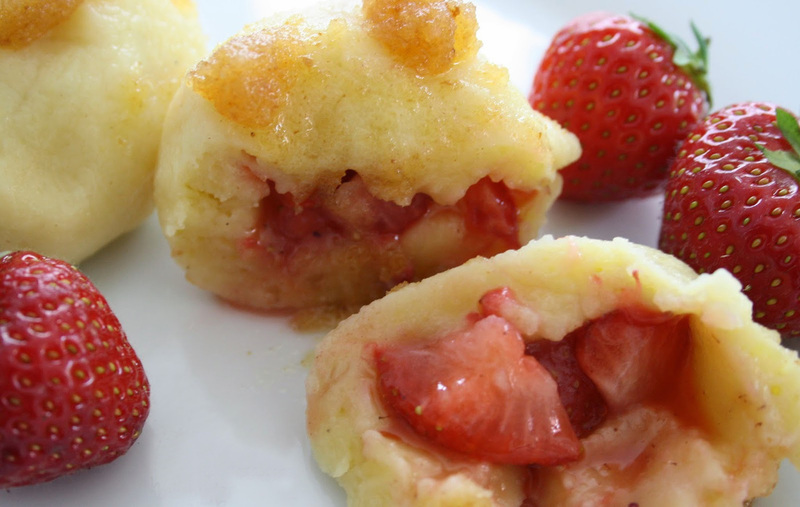 Erdbeerklöße are strawberry dumplings. Klöße (also known as Klösse, Klees, Glees, Glace etc.) is a type of dumpling. In the Volga German dialect this dish often sounds like Eben Glace or Eben Glees. These are traditionally served as an entree, with cooked sausages. In a large mixing bowl, mix together flour, eggs and hot water to form soft dough. Remove from bowl to floured board and knead until most of flour is absorbed. Cover dough with cloth and let rest for 30 minutes. Divide dough into fourths. Working with one portion at a time, roll the dough slightly thinner than pie dough. The dough will be elastic and more like bread dough than pie pastry. Cut 4-inch squares out of the rolled dough. (You will get 6 to 8 squares out of each portion of dough.) Place 3 to 4 tablespoons berries in the middle of each square. Sprinkle berries lightly with sugar. Bring 4 corners up over berries, pinching the edges securely together to hold in berries. Carefully drop dumplings into boiling water (about 6 at a time fit in an 8- to 10-quart kettle). Cover and bring back to a boil. Boil gently about 10 minutes. Use a skimmer or slotted spoon to remove cooked dumplings and place in warm, ovenproof serving bowl. Drizzle each batch of dumplings lightly with a few tablespoons melted butter, a few tablespoons cream and some chopped berries. Keep bowl in warm oven while boiling additional dumplings. Note: Use real butter only. Do not substitute reduced-fat spreads; their higher water content often yields less-satisfactory results. 4 c. flour 2 eggs 1 c. hot water. Make dough. Let rest. Divide dough and roll one 1/4 at a time. Roll as for pie dough. Cut into 4" squares. Top with sweetened fresh strawberries (use only fresh berries) and 1/2 teaspoon of dried bread crumbs. Bring corners up and pinch well. Drop into boiling water -cook 5-7 minutes. Drain. Cover with cream and melted butter. This is a meal not a dessert. My grandparents came from Norka. This what they ate and what I grew up eating.